I’ve read a few legal thrillers over the years. From John Grisham’s Runaway Jury to Michael Connelly’s The Lincoln Lawyer, the excitement of the case is usually matched by the excitement surrounding the legal proceedings. Darin Gibby’s Chasing Hindy certainly fits the bill for a legal thriller, but perhaps with a little less polish than the big hitters in the genre. Even so, this book certainly kept me engaged and interested throughout, which is the mark of a good thriller, no matter what sub-genre it belongs to. Plus, even if the subject matter could have trended into “preachy” territory, Gibby manages to put the opinions about the environment in the subtext, and not in the reader’s face. While I would recommend this book to anyone who enjoys this genre, I do have a few problems with it. First, the main character, Addy, is an interesting character, but I kept forgetting she was Vietnamese. Sure, she didn’t grow up there, but I kept picturing some blonde, white American instead of what the author intended. Furthermore, considering all the obvious red flags that led to the central conflict, I’m still surprised she made the decision she did (even if it was more than likely “romance-motivated”). Regarding plot, there were a few cringe-worthy clichés, and the redundancy of the news reports about the “lawyer on the lam” was a little unnecessary. Despite all this, Gibby has crafted a narrative that successfully follows the notion that, in order for a good story, you must have a character with a clear goal and an unending amount of obstacles to prevent them from achieving that goal. In fact, I almost expected things to go wrong around every turn, which almost made the plot somewhat predictable. At least somewhat predictable plots are still entertaining since they deliver on the consequences of the foreshadowing and set-ups. On a side note, I also appreciated the shout out to my alma mater of the Colorado School of Mines. 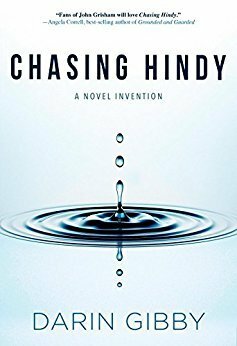 An eco-centered legal thriller that focuses on action over “preaching,” I give Chasing Hindy 4.0 stars out of 5.